Our story begins on Christmas Eve, where a young family vacations to Thailand for the holidays. Little did they know a few days later would become a memory/nightmare they would never forget. This is a remarkable true story about the human spirit and the struggle to survive even during the most severe circumstances. Director Juan Antonio Bayona does a fantastic job in his newest film The Impossible. Not only does he pay respect to the countless victims that lost their lives in the devastating tragedy, he makes artistic choices and liberties only the most seasoned directors can make. 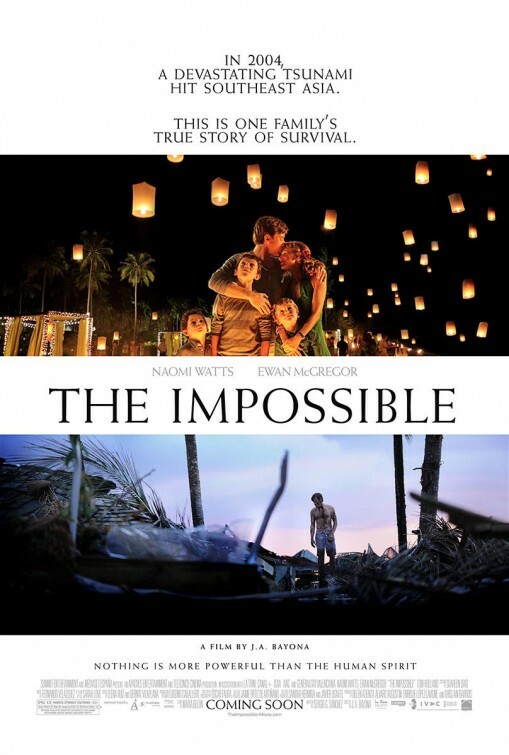 Academy Award Nominee Naomi Watts (who's nominated this year for Best Actress) and Ewan McGregor are married in the film with three little boys, and after the tsunami they ultimately get separated. Normally after a huge devastation the second half of the movie tends to lag and get tired, but not here. The real meat of the story is in the aftermath - the trials this family faces and everyone they encounter along the way. Tell me what you thought?? My sister is the BEST!! !